23 Movements, 6 kicks, 6 punches, 2 keup. Ready stance (Joonbi) Moving left foot, step forward into a left forward stance (Ap Kubi). Execute a down wedge or opening block (Arae Hecho Makki) with the fists closed. Execute a right front kick (Ap Chagi). Assume a right forward stance (Ap Kubi). Execute a palm inward middle wedge block (Momtong Hecho Makki). Execute a left front kick (Ap Chagi). Assume a left forward stance (Ap Kubi). Execute a high X block (Otkoreo Olgul Makki). Execute a right side kick (Yop Chagi) landing into a left back stance (Dwit Kubi). Execute a right double knife hand middle block (Sonnal Momtong Makki). Moving the left foot, turn 270° counterclockwise into a right back stance (Dwit Kubi). Execute a left outward middle block (Momtong Bakkat Makki). Shift the left foot to assume a left forward stance (Ap Kubi). Execute a right upper punch (Olgul Jireugi). Keep both feet fixed. Execute a left upper block (Olgul Makki). Execute a right side kick (Yop Chagi) landing into a left back stance (Dwit Kubi), then execute a right double knife hand down block (Sonnal Arae Makki). Shift the right foot to a right forward stance (Ap Kubi). Execute a left middle punch (Momtong Jireugi). Moving the right foot, turn 180° clockwise into a left back stance (Dwit Kubi). Execute an outward middle block (Momtong Bakkat Makki). Shift the right foot to assume a right forward stance (Ap Kubi). Execute a left upper punch (Olgul Jireugi). Keep the feet fixed. Execute a right upper block (Olgul Makki). Execute a left side kick (Yop Chagi) landing into a right back stance (Dwit Kubi). Execute a left double knife hand down block (Sonnal Arae Makki). Shift the left foot to assume a left forward stance (Ap Kubi). Execute a right middle punch (Momtong Jireugi). Moving the left foot, turn 90° counterclockwise into a left forward stance (AP Kubi). Execute a down X block (Otkoreo Arae Makki). Stay in the same stance. Execute an upper X block (Otkoreo Olgul Makki). Stay in the same stance. Bring both hands to the hips and execute a right upper punch (Olgul Jireugi). Yell (Kihap). Pivot 180° clockwise. Stumping with the right foot, assume a horse riding stance (Juchum Seogi) looking toward 9 o’clock. Execute a right down side block (Arae Yop Makki). Pivot 180° counterclockwise and slide the left foot forward into a left front stance (Ap Kubi). Execute a left, palm down, knife hand strike (Sonnal Bakkat Chigi). Execute a right outside-inside crescent kick (Pyojeok Chagi), striking the left hand. Land into a horse riding stance (Juchum Seogi). 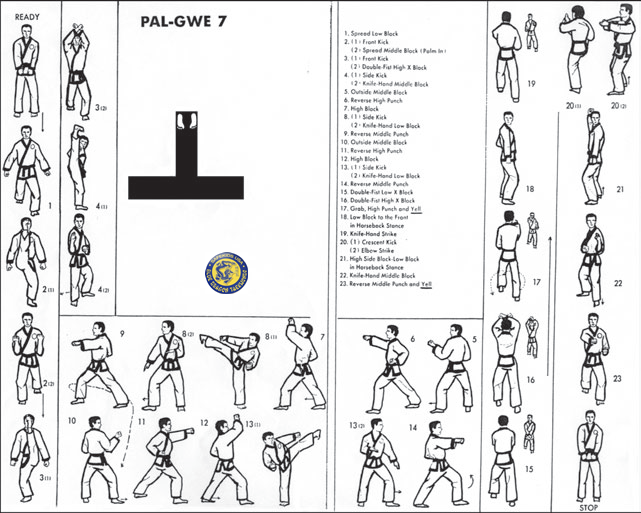 Execute a right elbow middle strike (Palkup Pyojeok Chigi). Slide back into a horse riding stance (Juchum Seogi) and execute a single mountain block (Waesanteul Makki). Shift to the rear assuming a right back stance (Dwit Kubi). Execute a left double knife hand middle block (Sonnal Momtong Makki). Shift forward into a left forward stance (Ap Kubi). Execute a right middle punch (Momtong Jireugi). Yell (Kihap).Ready stance (Geuman) Keep right foot fixed, move the left foot to the rear.